It amazes me to look at the list of things I wanted to accomplish yesterday and see from here that they’re all accomplished, but now there’s another list, just as long. Yesterday I did the shopping and hung the shade and did some cleaning and mowed the lawn and hacked the grape leaves and put out the tables and strung the lights. Whew. The lights are beautiful and old fashioned-looking, even though they’re from Target. Target’s good at satisfying my nostalgia cravings at a reasonable price. 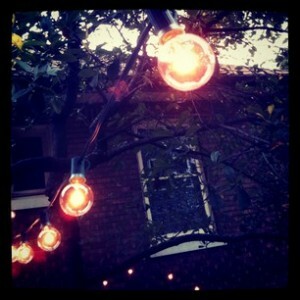 Not that I grew up with anything that looked like these lights, but they’re something I picture having grown up with. The problem is, they’re real glass, so they’re breakable. You know, how things used to be. I got my ladder and a drill and some hooks, and hung them high on the house, stringing them over to the cherry tree. As I was weaving a strand through a branch, one loose bulb fell out and shattered on the cement. Dave heard it from up in his office and came to the window. “Ow,” he said. “You’re going to take them down?” he asked. As a compromise, I hung the plastic lights too, across another part of the yard. Now I need to put electrical tape over the empty socket of the fallen bulb and another one that burned out already. Though with the way the sky is thundering, I can quit worrying about anyone being outside when the daggers start falling. Instead, I can worry about whether anyone is going to show in the rain, whether I want anyone to show up in the rain, and how we could possibly feed them when we have no kitchen and Dave refuses to barbeque in the garage. Once again, The Robot serves up a series of referential metaphors revealing truths too difficult for a bear of little brain. Nostalgic yearnings for a fragility and vulnerability that one does not personally recall. A fallen orb shatters. At the urging of X – the moral center of the tale – we intermingle the “real” points of lights with the plastic ones, but at what cost, yet I still DON’T UNDERSTAND WHY DAVE WON’T BBQ IN THE GARAGE. Suddenly, X being a carpenter all makes sense.